Before the advent of metal-working all of our ancestors depended on implements made out of rock for survival. Stones can be shaped into a variety of functional tools, such as arrowheads, axes, knives, and grinding implements. Having a basic understanding of how to shape and use rock is an invaluable wilderness survival skill. In this day-long workshop, participants learn how to use common stones found in Western Washington. 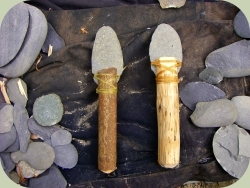 Each participant creates a basic stone knife and other tools to take home.